Doris Lake: Easy-to-Moderate. Six miles round trip to Doris Lake and 10 miles round trip to Doris Mountain. Fishing. Great views. Access via the Alpha and Beta Lakes Road up the South Fork. Trail No. 52 [Warning. Acess has been temporarily limited because of logging operations. 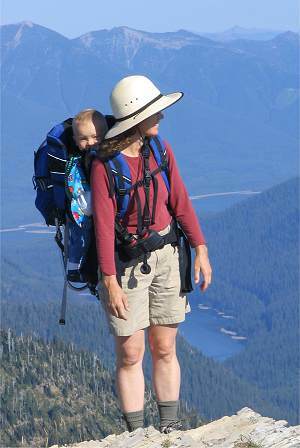 Jewel Basin Hiking Area: A spectacular network of trails linking alpine lakes and surrounding high country. Scenery is the main draw, but fishing and wildlife watching are also excellent. Most access is via Camp Misery, at the end of Jewel Basin Road off Foothill Road. Consider a six-mile loop to the top of Mt. 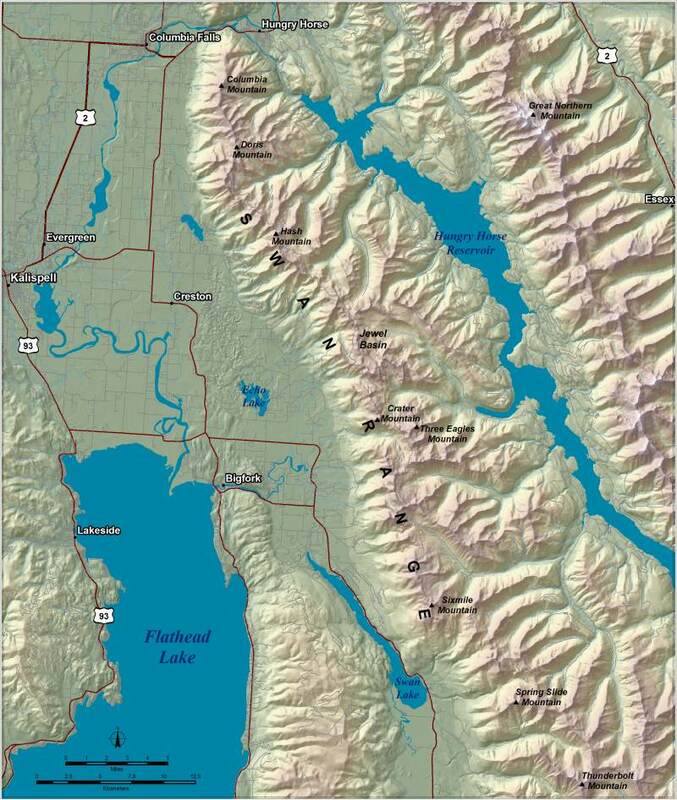 Aeneas; a 13-mile round trip to Crater Lake; and 8-mile round trip to Wildcat Lake; or a 22-mile round trip to Big Hawk Lake. Bond and Trinkus Lakes (photo right): A 14-mile round trip, with a significant climb of 2,500 feet. The trailhead is off the Bond Creek Road, just south of the village of Swan Lake. The lakes are a visual reward after hiking through the trees, and Trinkus is known for its trout. Trail No. 21. Columbia Mountain: Moderate-to-difficult. 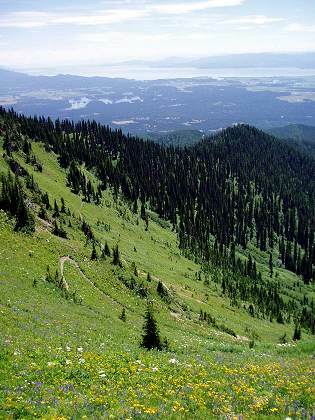 Hike 4 miles round trip to a double waterfall or 12-mile round trip to the top of 7,234-foot Columbia Mountain. Great views at the top. Wildflowers are abundant both in the forest and in the alpine. Trailhead: Off Monta Vista Drive off Highway 206. Trail No. 51. Swan River Natural Trail: An easy, 4-mile walk for the whole family along the "wild mile" of the Swan. This walk starts in the heart of Bigfork Village. Look for water dippers (and kayakers) amid the rapids and osprey overhead.